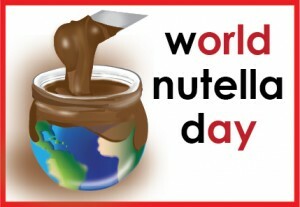 Today is the 8th annual World Nutella Day. As if I needed an excuse to eat Nutella. But if you insist, I made banana bread with a tunnel of love. The trouble with baking Nutella though, is its smoothness and flavor degenerate with heat (as evidenced in my Nutella babka). It’s also candy sweet. So I added a bit of cream for smoothness and chopped chocolate for complexity. Mission accomplished: my cake had lava-like craters of chocolate. I ate three pieces in one sitting, and someone else ate four. It was brown and caramelly because of coconut sugar. Coconut sugar (my favorite new baking ingredient) is a whole, unrefined sweetener from coconut nectar. It has 412 times the potassium of cane sugar and also contains magnesium, zinc, iron, and B vitamins. It has a low glycemic index too: 35 compared to agave (42) and cane sugar (68). Most importantly, it tastes good, like a tropical toasted marshmallow. You can generally substitute it 1:1 for white sugar. Just know that coconut sugar has some moisture (add more cream of tartar to meringues), and while it resembles brown sugar, the latter has more acidity (adjust leavening accordingly, or only use in place of white sugar). I dig Big Tree Farms because it’s fair trade and not diluted with other sweeteners. Find it at Whole Foods, Amazon, or Vitacost (use the link for $10 off an order of $30 or more). 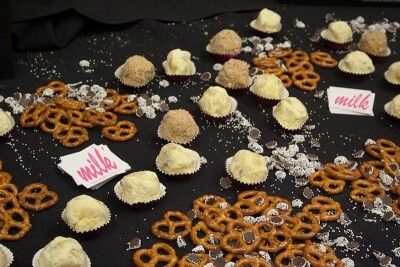 Thanks to Ms Adventures in Italy and Bleeding Espresso for hosting World Nutella Day. For 700 more recipes, check out the website. Remember, keep calm and eat Nutella. Preheat oven to 350° F. Grease and flour a 9"x5"x3" loaf pan. In a small bowl or measuring cup, combine the Nutella and cream. If mixture is stiff, microwave for 10 seconds at 50% power. In a large bowl, mash the peeled bananas with the sugar. Beat in eggs, oil, and vanilla with an electric mixer on low speed. In another bowl, whisk together the flour, baking soda, and salt. Add to banana mixture and beat on low speed just until combined. Pour 1/3 of batter in pan. Take half of the Nutella and cover the batter with tablespoon-sized dollops. Sprinkle half of chocolate on top. Add 1/3 more batter and layer again with remaining Nutella and chocolate. Add the rest of the batter. Zig zag a knife through the pan (just once through, so chocolate streaks remain). If pan is more than 2/3 full, place a piece of foil below the pan to catch drippings. If pan is more than 3/4 full, prepare for major spillover or add excess to another pan. Bake for one hour, or until the top springs back when touched and a toothpick inserted in the center comes out without batter (melted chocolate may stick). Chocolate may ooze out, and center may sink when cool. Don't worry, your cake just has character. Cool and serve from pan (cake will be too delicate to unmold). What’s worse than getting poppy seeds stuck in your teeth? How about black sesame? That stuff can stain, but it’s worth it. Besides being one of my favorite flavors, it’s high in anthocyanins (the stuff of blueberries), calcium (more so than white sesame), magnesium, and other minerals. It’s even used in Chinese herbal medicine. 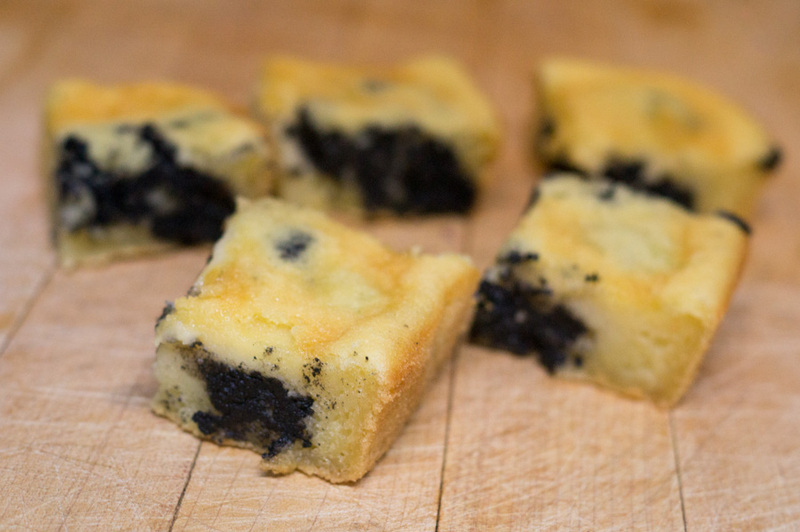 Black sesame lends an almost smoky flavor to brittle, soup, and sticky rice desserts. Curiously, it’s not in nian gow, but I set out to change that. Nian gow literally means “sticky cake,” but since it also sounds like “higher year,” folk wisdom says it’s good luck to eat on Chinese New Year. Sweet versions have sticky rice flour, water, sugar, and sometimes red beans or dates. They’re steamed, and leftovers are pan fried till crispy. Since I don’t have a large steamer, I prefer to bake mine and skip straight to the golden brown deliciousness. If you like brownie edges, you’ll like baked nian gow. Some years ago, Chow posted a baked version, and people cried fowl over the nontraditional recipe. So what? I’m Chinese and I approve. So does my family. In fact, they’ve eaten it 24 times in a year. Sweet rice flour, also known as glutinous rice flour or mochiko, is made from ground sticky rice grains. It's actually gluten free and not the same as regular rice flour. Find it in Asian markets or health food stores in the baking or starch section. It typically comes in one-pound bags. You can use Chinese black sesame paste (tahini is different; its seeds are untoasted) and sweeten to taste, but it's less expensive to make at home. If starting with raw seeds, heat in a pan over medium heat. Keep shaking the pan (so seeds don't burn) til two or three seeds jump. Remove from heat immediately and cool completely. Black sesame paste inspired from Just One Cookbook; rice cake inspired from Frances Kai-Hwa Wang. Combine the sesame seeds with 2 tablespoons oil in a food processor, occasionally stopping to scrape the seeds down the side. Process until smooth, adding oil by the tablespoon as you see fit. It will take take some time for the seeds to release their oils and smooth out. Add the honey and process till smooth. Preheat oven to 350° F. Grease a 9"x13" pan and dust with rice flour. Combine all ingredients except sesame paste and vanilla with an electric mixer at medium speed for two minutes. Add vanilla and mix just until combined. Batter will have the consistency of a thin milkshake. Pour half the batter in the pan. Drop the sesame paste by rounded teaspoons evenly into batter (the paste will be too difficult to spread). Pour the rest of the batter on top. Bake for 40-50 min., or until a toothpick inserted in the center comes out clean. Cool and cut into squares. Serve at room temperature or slightly warmed. Dairy-free version: substitute the milk with 2 cups water. I call these psychotic brownies. They’re for those days where if you don’t have chocolate, you’ll hurt someone. Or when you can’t think of anything else till you get a hit of chocolate. They’re one of the few things that can satisfy the chocolate monster within. 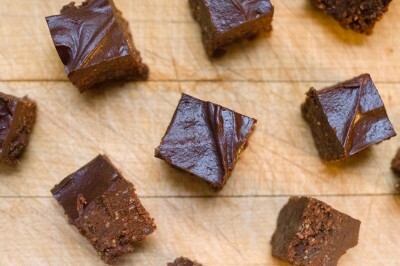 These brownies also happen to be raw and gluten free. They’re nutrient dense because they’re full of cocoa (fiber, iron, flavonoids), nuts, fruit, and don’t have refined sugar. Of course they’re calorically dense too, but if you’re going to eat something delicious, it might as well be functional. Taste wise, I prefer them over most brownies (the exception being one recipe with 12 ounces of chocolate and three sticks of butter, but come on). The coconut-oil ganache is my new substitute for Nutella, and if you use hazelnuts, you’ll have that flavor profile. This recipe is a lose blueprint. The minimal amount of maple syrup (1/3 cup each in the brownie and ganache) was sweet enough for me. I used toasted nuts because I like the flavor better, but if you’re on a raw diet, simply use raw nuts and cocoa (unless labeled, cocoa is not raw). You also have a couple choices for the dates. Medjools are the king of dates because of their jumbo size and moistness, or you can use the cheaper, more common Deglet Noor. These brownies are difficult to mess up. Can you hit a button on a food processor? Good! 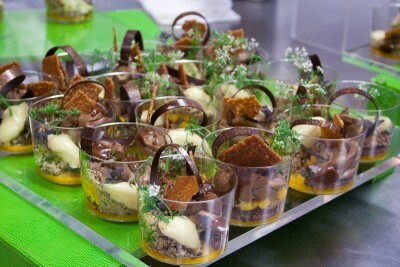 Adapted from Gourmande in the Kitchen. 2 cups (224 grams) almonds or your favorite nut, toasted at 350° F for 15 min. Grind nuts in a food processor until very fine (be careful to not over process the nuts into butter). Add the coconut and process till fine (as close to the consistency of flour as possible). Add the dates (if using old dates or the Deglet Noor variety, add a couple tablespoons water) and mix until a soft paste forms. Add the cocoa and process again. Add the maple syrup, salt, and a couple tablespoons water (if necessary) and process till creamy, scraping down the sides with a spatula as needed. Line an 8" x 8" pan with parchment paper or plastic wrap. Using the back of a glass cup or damp hands, flatten mixture into pan. Place in fridge while making the ganache. In the food processor (no need to wash), mix the maple syrup and coconut oil until well combined. Add the cocoa and salt and process until smooth, scraping down the sides as needed. Pour ganache over the brownies and spread evenly. Return the pan to the fridge to firm up for at least one hour. Cut into one-inch squares, and for the best texture, let warm to room temp for 15 min. before eating. Store leftovers in an airtight container in the fridge. For raw brownies: use raw nuts and cocoa powder. Here are a few of my favorite things that I’ll be gifting this holiday season. I wouldn’t mind receiving them either! They’re twists on old classics and will surprise you. This is by far my favorite chocolate find of the year. 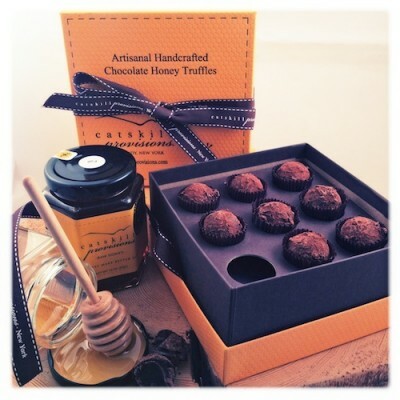 Chocolate and honey are assertive and tend to overpower each other. These truffles, however, have the richness and complexities of both flavors. 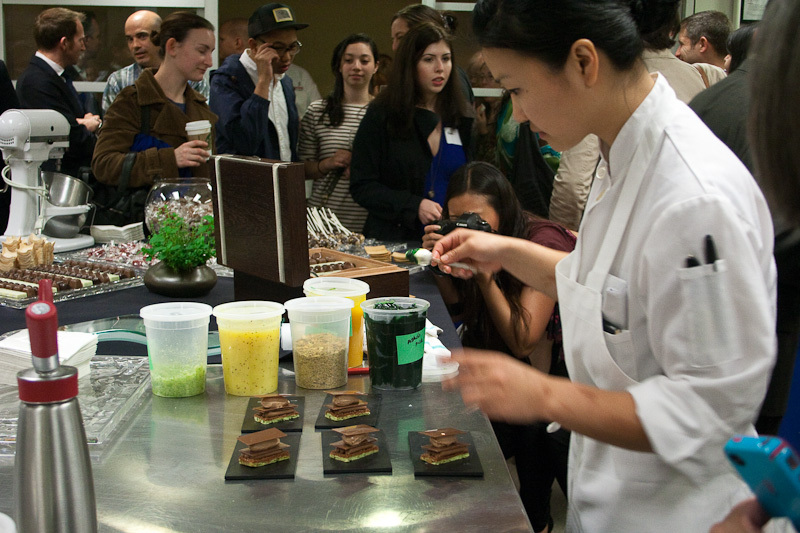 Co-founder Claire Marin took a full year to perfect the truffles. She started with her raw fall honey, with rich notes of maple and buckwheat. 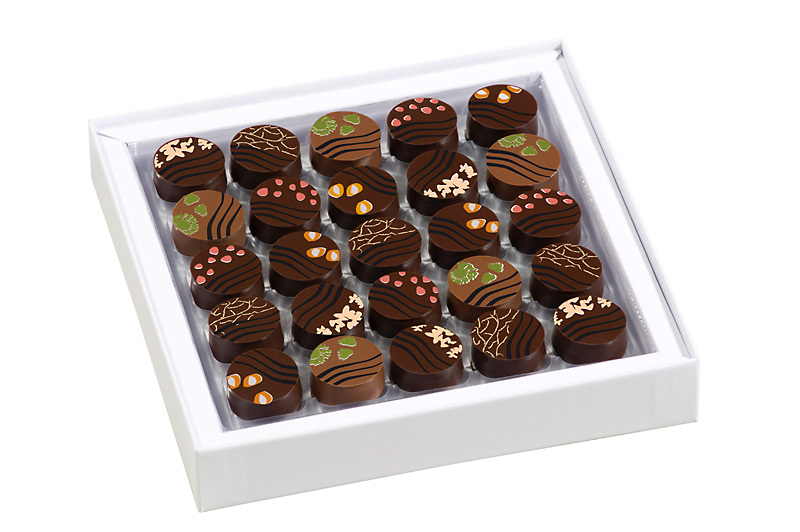 After trying a variety of chocolates, she was satisfied with Callebaut 72% (whose neutrality works in the honey’s favor) and brought everything together with a touch of organic NY state butter. They’re pricey but worth it. 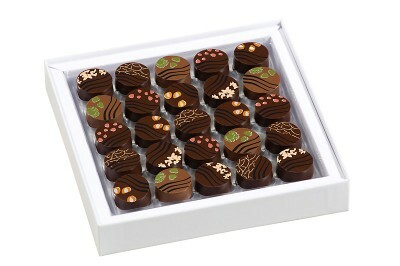 From $15 for 4 plus shipping; catskillprovisions.com. Natural foodists claim that raw or sprouted foods are more nutritious and easier to digest. I’m not sure whether it’s folk wisdom because by the time most sprouted food reaches you, who can say it’s still “alive?” I have yet to see definitive scientific studies, and UC Davis says the nutritional difference between sprouted and unsprouted grains is negligible. So while Jem has a following among health nuts, my primary concern is taste. They exceeded my expectations. Jem’s almond butter is silky smooth (ground to less than 20 microns, where your tongue can’t distinguish individual particles) and packed with superfoods: butterscotch-y maca (a root vegetable that Incas ate for energy), warming cinnamon, and low-glycemic coconut sugar from Big Tree Farms. 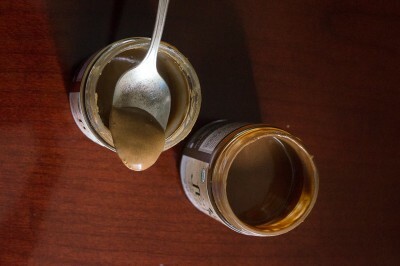 It tastes like Biscoff cookie spread but without that greasy, heavy feeling. Jem also makes other varieties such as chocolate hazelnut, but the latter has a wild, astringent taste. It’s pretty good for something healthy, but the cinnamon almond is good, period. $12.99 for 6 oz., jemraw.com. Also available at various retail stores. 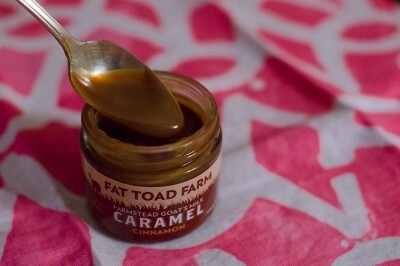 I had grand plans to add this caramel to banoffee pie, Greek yogurt cheesecake, coconut cream pie, and Belgian waffles, but I couldn’t resist eating it straight from the jar. Made with goat’s milk, this caramel has a gentle tang and buttery smoothness. You could make it at home, but to do it like Fat Toad, you’d have to pasture goats and cook the sauce by hand for six hours. Get yourself at least two jars: one for impulse dipping and the other for actual recipes. $13 for 8 oz., fattoadfarm.com. How hot is it in New York in the summer? So hot I used a man just for his shadow. So hot you be frying bacon on the sidewalk. At least that’ what some say. For me, it’s so hot that merely going into the kitchen is reason to shower. So when I craved cheesecake, I whined, “I don’t wanna turn on the oven, don’t wanna!” Enter sweetened condensed milk: malty, smooth, and the antidote for baked custard. This cheesecake is sweeter than most, so the crust doesn’t need additional sugar, and it balances rhubarb (or any tart fruit). Yes, that pinkish celery thing that actually doesn’t need strawberries. It’s floral and fruity on its own, kind of like pink lemonade. How’s that for a vegetable (and a no-bake dessert)? When it's so hot you can fry bacon on the sidewalk, this refreshing no-bake cheesecake promises to be a smooth and tart treat. Rhubarb compote adapted from Vegetarian Cooking for Everyone. Crust adapted from Joy of Cooking_1997. Cheesecake adapted from Divas Can Cook. Place rhubarb, sugar, and lemon juice in a heavy pan. Cook over low heat until the rhubarb has softened, about 10 minutes. Cool completely and store in the fridge. Stir graham cracker crumbs and butter in a bowl until evenly moistened. Pat into a deep-dish 9-inch pie pan. Meanwhile, beat cream cheese on medium speed in a large bowl. When softened, add sweetened condensed milk and mix till smooth. Beat in lemon juice and vanilla. Pour cream cheese mixture into prepared pie crust and refrigerate until firm, or at least three hours. 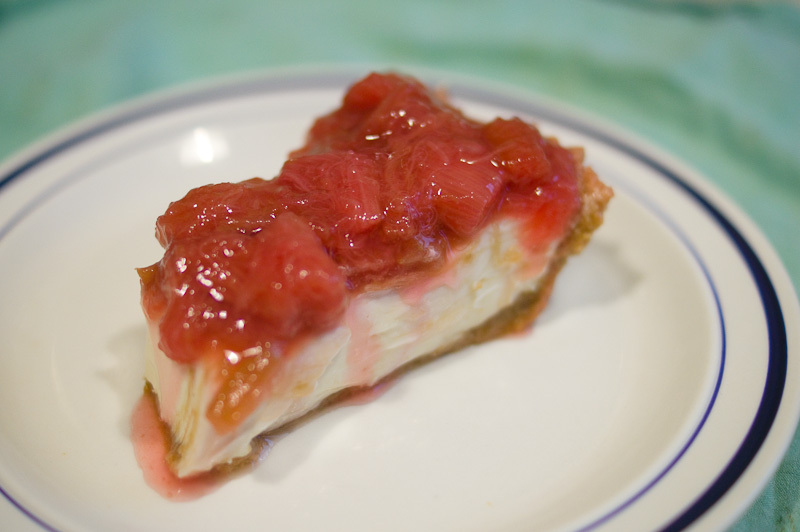 When ready to serve, spread rhubarb compote over cheesecake. Save leftover rhubarb for (frozen) yogurt, vanilla ice cream, or pudding. Picking a favorite chocolate cake is like asking a teacher to choose a favorite student, or a parent a child. Narrowing down the categories is hard enough: molten, Nutella torte, layered… But if I could only go with one, it’d be the classic layers. Specifically, this vegan chocolate cake. Vegan or not, this cake is all about the balance. The first thing you taste is the chocolate—not the sugar (nor any off flavors). The frosting (previously paired with chocolate-potato cake) is like a whipped truffle. Although the cake was developed by the perfectionists at Cook’s Illustrated, I replaced the vegan butter substitute with virgin coconut oil, which has a mellow sweetness and texture akin to real butter. Although coconut oil is high in saturated fat, it’s not the same kind that’s found in animal products. In fact, the medium-chain fats/lauric acid improve cholesterol ratio levels and may speed up metabolism. I’m not saying you should eat gobs of it, but it’s not as unhealthy as previously thought. Don’t worry, the cake won’t taste like Hawaiian Tropics. You may be wondering: why can’t I make that easy “dump” cake from Joy of Cooking? Will this recipe really turn out? I used the Joy of Cooking recipe for years, but it’s a snack cake. Something you might eat while watching an action flick. This recipe is something you eat at a fireplace with classical music in the background. Cake adapted from Cook's Illustrated. Frosting adapted from More Great Good Dairy-Free Desserts Naturally by Fran Costigan. 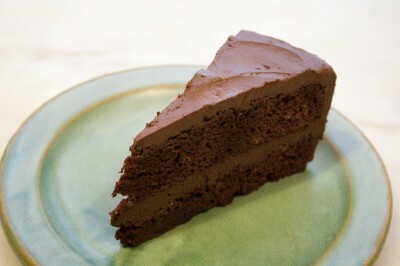 Vegan or not, this cake is a winner for its delicate texture, deep chocolatiness, and truffle-like frosting. Position racks in the middle of the oven and preheat to 350° F. Grease and flour two 9-inch round cake pans. Sift sugar, flours, baking soda, and salt into a large bowl, then whisk to combine. In another large bowl, combine cocoas and chocolate. Pour hot coffee over mixture and whisk until smooth. Combine coconut milk, vinegar and vanilla in large cup. Place coconut oil in a medium bowl and add the coconut-milk mixture in two additions, whisking until smooth after each. Add the coconut mixture to the chocolate and whisk to combine. Add this mixture to the dry ingredients, folding gently with rubber spatula until just incorporated and no flour streaks remain. Divide batter evenly between pans and bake until toothpick inserted in the center comes out clean, 20 to 25 minutes, switching pans and rotating them after 12 minutes. Cool cakes in pans to room temperature, about 2 hours. Combine the drained tofu, oil, and salt in a food processor, and process about 1 minute until pureed. Use a rubber spatula to clean the sides of the bowl and add the sugar, cocoa, and vanilla. Process 1 to 2 minutes, until the tofu mixture is smooth. Add the melted chocolate and pulse the processor three or four times to incorporate. Process 1 to 2 minutes until the mixture is very creamy. Refrigerate in the processor for 20 minutes. The cream may need to chill for 1 to 6 hours in order for it to become firm enough to spread. The degree of firmness will determine the amount of soy milk needed to create the final texture. It should be thick but easy to spread. Dip an icing spatula into the cream to test to the texture. If the cream is too stiff to use, add 3 tablespoons of the soy milk and process 1 minute. Add more soy milk, 1 tablespoon at a time as needed. When the cream is ready to use, spoon it into a bowl and begin to assemble the cake. Level off the top of the cakes (mine always come out domed): With a serrated knife in your dominant hand, keep your cutting arm against your body and bend your forearm so it’s parallel to the cake. Steadily place your free hand on top of the cake and turn it counter-clockwise (if you're left handed, rotate the cake clockwise) into the knife. Do not move your cutting hand. Keep pushing/rotating the cake into the knife, and you’ll get a clean cut. Top one layer with a cup of frosting (when in doubt, it's easier to work with more frosting than less). Spread the frosting to the edges by rotating your wrist. To prevent stray crumbs, lift the spatula off the cake as few times as possible and gently nudge the frosting rather than making sweeping movements. Place the second cake layer on top and cover the top and sides with frosting. After one day, store cake in fridge. 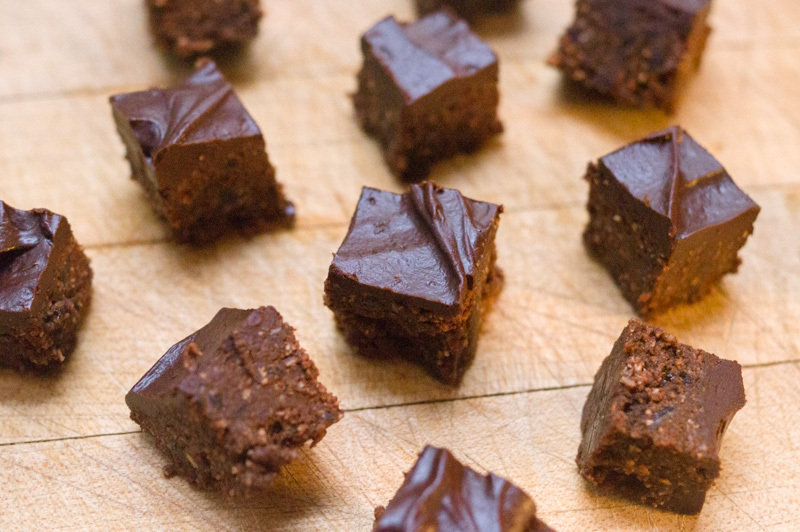 Save the leftover frosting for vegan truffles! Vegan. Gluten free. No added fat. No added sugar. Sounds like a recipe for disaster…or the holy grail. I’ve tried many variations of nutritious cookies, and they’re either gummy door stops or no healthier than regular cookies. For a while, I thought these cookies were the best I could do. Then I found a much better recipe on Watching What I Eat, which I prefer over many traditional cookies. The ingredients don’t sound special, but give these a try, okay? You may find that they replace your muffins, protein bars, and granola bars. These cookies have been lifesavers when I rush out the door in the morning. I time my commute by the minute; if I’m not at the train station by 9:06, there’s a good chance I’ll be late to work. So thank you, Cookies, for being my meal in my hand! Feel free to make these cookies your own. I love coconut oil (it’s not as unhealthy as previously thought and may even be a superfood), and it gives a toasty texture and flavor. Keep in mind that they’re faintly sweet, so do adjust your tastebuds. While traditional cookies should come out of the oven just when the edges set, I bake these to the upper limit so the edges are crisp and insides aren’t gummy. Be sure to try them fresh from the oven! These cookies are endlessly customizable and can take your favorite ingredients and spices. 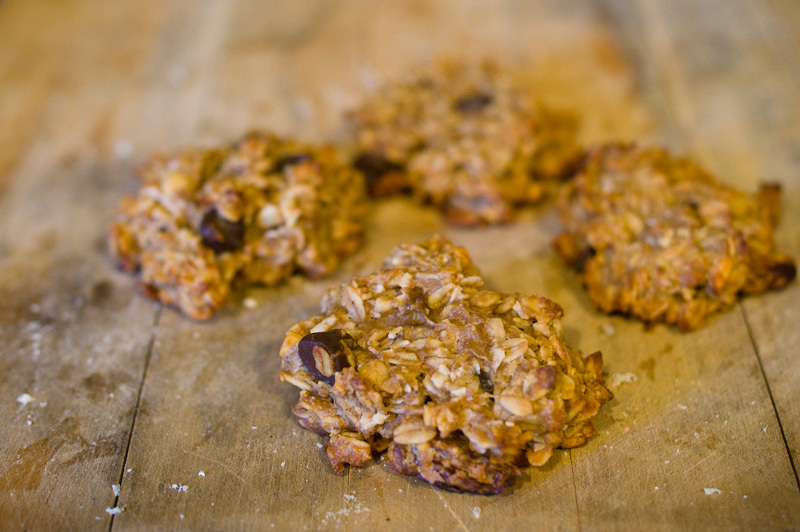 To make these gluten free, use oats that are certified gluten free (regular oats are cross-bread with wheat or may be contaminated through handling). Line two baking sheets with parchment paper or greased foil. Preheat oven to 350° F with the racks in the upper and lower thirds. In a large bowl, thoroughly mix the mashed banana, peanut butter, and coconut oil (if using) with a wooden spoon. Then incorporate the applesauce and vanilla. 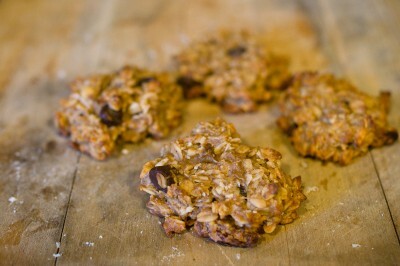 Stir in the remaining ingredients: the oats, salt, coconut/nuts, and chocolate chips/dried fruit. Drop the dough by hockey puck–sized spoonfuls and flatten to 1/2- to 3/4-inch thick. Bake for 20-30 min. (rotate cookie sheets after 10 min. ), until golden brown on the edges. When completely cool, store in a cookie tin. The cookies attract moisture; you may need to store in the fridge after the second day. Sometimes I’m a glutton for punishment. 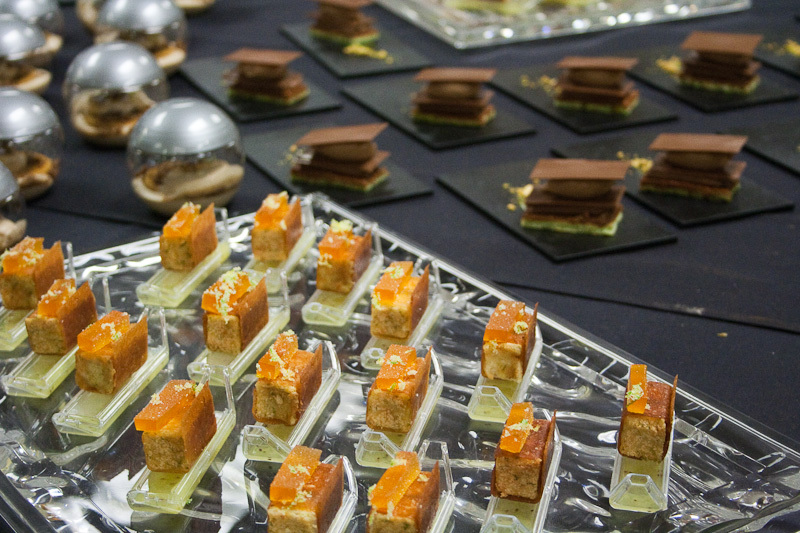 Last night, Dessert Professional presented the 19th annual Top 10 Pastry Chefs in America awards. 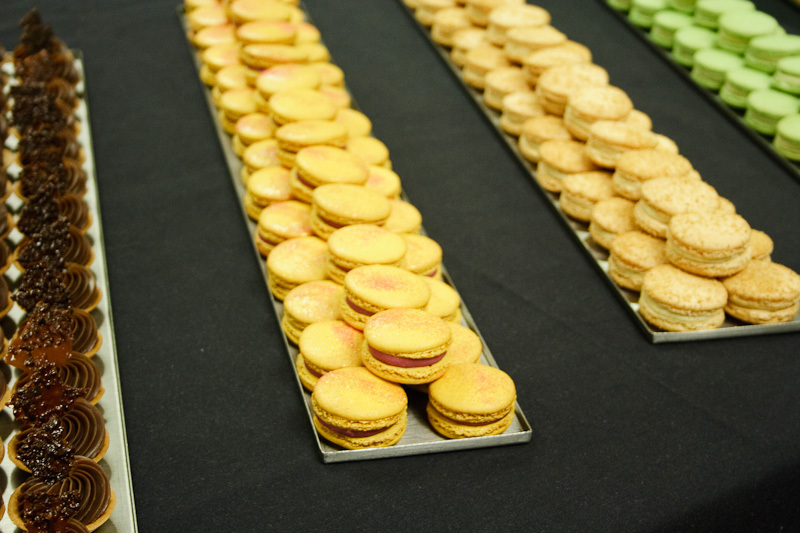 This ain’t no Oscars, where you sit back and clap; you get to eat all the creations. 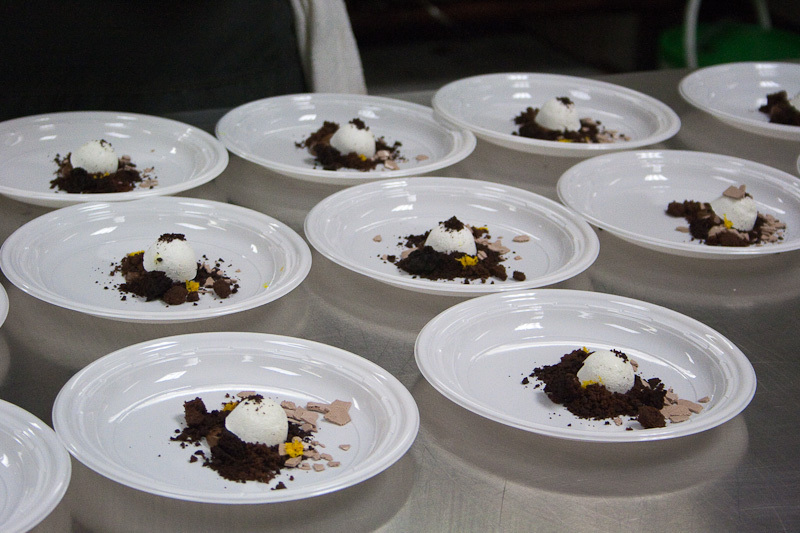 Since they’re overachievers, some chefs presented more than half a dozen desserts. It was enough to make the biggest sweet tooth go rabid. Indeed, that happened. Guests crowded around a server carrying savory food, toppling h’ordeuvres over the poor guy. This was my version of a wild night. And I’m thankful some familiar faces joined in the debauchery: Robyn and Max from Serious Eats (two sweet people), fellow dessert nerd Niko from Dessert Buzz, Kempie from Gourmet Live, Melissa from The Spatula Queen, and Kirsten from the Food Network. Here’s tasting below (several desserts were so complicated they were only known by their components). Click on the pictures to enlarge. 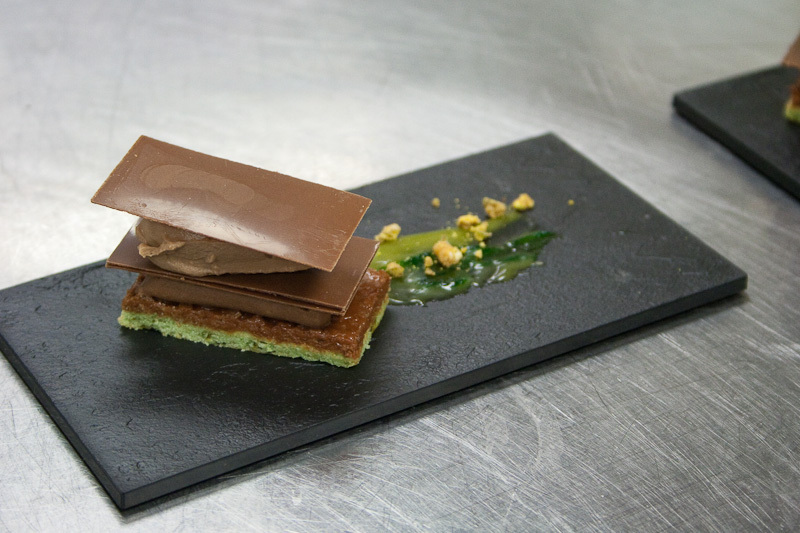 The pistachio cake with milk chocolate layers was an architectural wonder, each layer giving way to contrasting textures. The citrus(?) “boats” with cream and crispy shells offered a tart contrast to other rich desserts. The space-age caramel verrines in the back faded in my memory. Too “ordinary.” Ha! Aumont’s assistant has a death-grip handshake. Milk chocolate complexite, molten milk chocolate beignets, pinot noir, and cocoa. 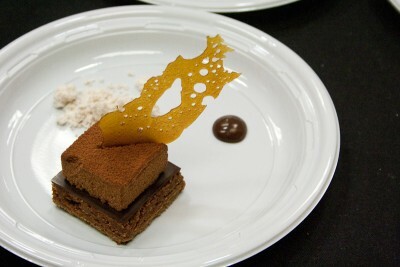 Deceptively simply looking, this almond dacquoise, milk chocolate parfait, salted caramel tuile was my favorite. It struck the right balance of textures and flavors. 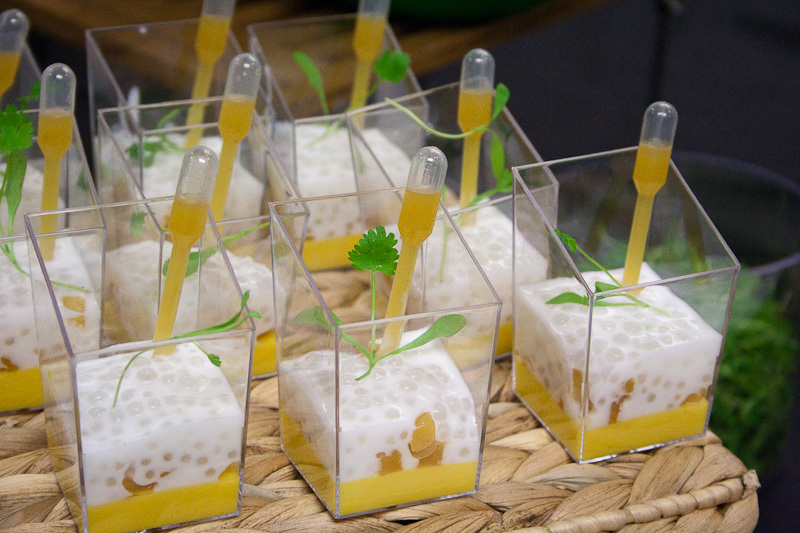 Refreshing tapioca, pineapple confit, lime, passion and mango cremeux, and lime coconut creme. Complete with a syringe. 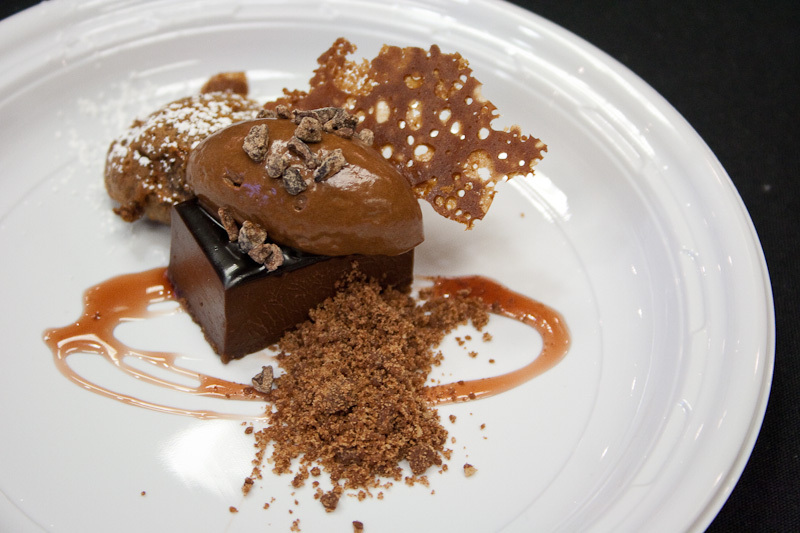 Tosi’s desserts are satisfying the way bar food is: fiendish and salty. The pretzel and chocolate chip cake truffles overpowered me last night, but they’re suited for a late-night snack. The 10th chef, whom I sadly have no pictures of, is Jean-Marie Auboine of Jean-Marie Auboine Chocolatier, Las Vegas. Someone explain to me the appeal of poppy seeds. You shouldn’t like them. They get stuck in your teeth. 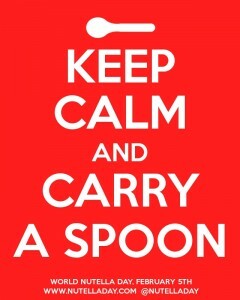 If you eat too many, you’ll test positive for opium (thanks for the lesson, Seinfeld!). Yet poppy seed muffin recipes are as prolific as chain letters, and a bagel wouldn’t be a bagel without those crunchy little pareils. Drug tests and teeth be darned; I like eating gobs of poppy seeds, not just treating them like garnish. This cake recipe is for people like me. If you’re celebrating Passover or are celiac, this recipe is definitely for you too. 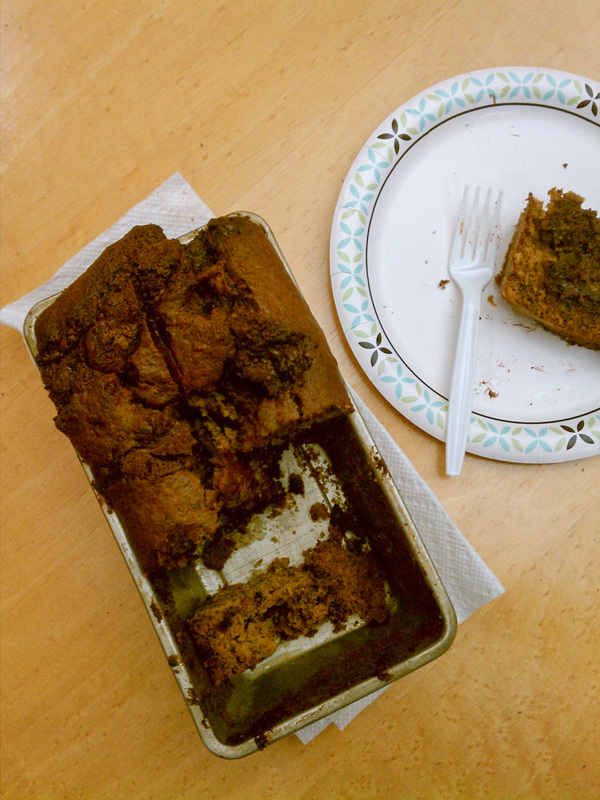 I adapted this cake from Chocolate & Zucchini, who riffed on it from Lilo. Clotilde at C&Z calls for almond butter and almond flour. I’m a minimalist and say you can make your own with whole almonds; it’ll taste fresher that way too. Preheat oven to 350° F. In an 8-inch round or square cake pan, toast almonds 10-15 min., or until flesh is light brown and fragrant. Cool for about 20 min. In a food processor, combine 100 grams (a little more than 3/4 cup) almonds and 100 grams (1/2 cup) sugar. Grease the cake pan (for baking later). Process until the almonds resemble a fine meal. 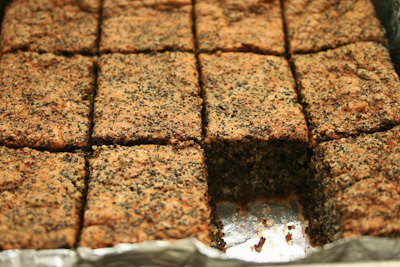 Transfer the almond meal to a small bowl and combine with the poppy seeds. Grind the remaining almonds in the food processor until it resembles nut butter. It will go from a fine meal to forming a ball around the blade to “butter.” If it doesn't seem like you're making progress, keep processing. The heat and friction will smooth out the almonds. Transfer the almond butter to a medium bowl. Add the butter, lemon zest, and egg yolks and combine with electric beaters till fluffy. Don’t be a smart aleck like me and attempt to mix in the food processor. The heat will scramble the yolks. Wash the beaters very well (twice if you need to). In a grease-free bowl, combine the egg whites with the salt and beat until frothy. With the beaters still running, gradually add the sugar and beat until the you get glossy, stiff peaks. Gently add one third of the egg whites to the almond butter mixture and combine with a spatula. Fold in half of the poppy seed mixture. Add another third of the egg whites and fold. Fold in the remaining poppy seeds, then the last of the egg whites, working carefully to keep in as much air as possible. Stop folding when the egg whites are incorporated (mixture can remain lumpy). Pour into prepared pan and bake for 30 min, until puffy and light brown. Turn oven off and let cake cool inside for 10 min. A rite of passage for any New Yorker is experiencing the wonder of Fairway. Its shelves are stocked with esoteric products: imported $12 bottles of fruit soda, “The World’s Best Brownie” (it doesn’t live up to its name, but what would New York be without its hyperboles? ), and matzoh crunch ice cream. It even has the old New York staple: rude customers. If you’re lucky, you’ll scrape by as people run you over with their carts and don’t even acknowledge your presence, much less apologize. Or things can get more personal. I once saw a customer at the olive oil sampling area, dousing his prepackaged salad with a bottle. “I think you’re supposed to pay for that,” I said. “You’re stupid!” he said and glared. Fortunately, you can now experience Fairway without the ‘tude. In December, it launched an online store, stocking spices, sauces, pasta, and olive oil that hasn’t been touched by miserly men. Lucky for me, they sent samples of chocolate bars, which have been repackaged from Lake Champlain Chocolates. Better than Hershey’s but not quite gourmet, they’re like grown-up candies. The short, stubby bars are the highlight, with well balanced, not too sweet flavors. My favorite by far was the chocolate-hazelnut bar (pictured), which is like a hunk of sophisticated Nutella with hazelnut pieces and crushed Pirouline-like cookies. The tartness of the dark chocolate, raisin, cherry, and pecan bar is also enjoyable. I only wish the fillings were smoother and resembled truffles. As of now, I only see the candy bars as part of small and large gift boxes (you can always go to Fairway and get whatever combo you want though). The larger bars are like filler. The chocolate itself is one dimensional and too thick on the truffle bars (pictured). 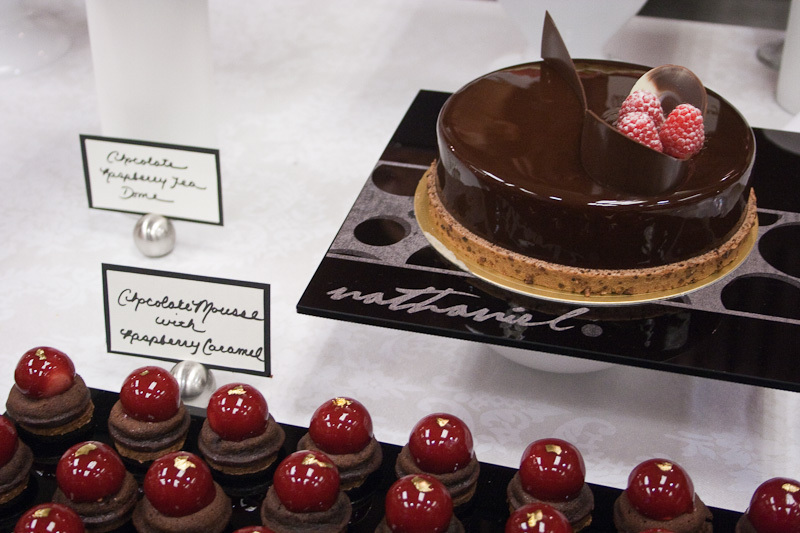 Although Lake Champlain and Fairway don’t specifically advertise it, the couverture (base chocolate) is from Callebaut, the only “Belgian” chocolate maker who would manufacture on such as scale. I’m not a huge fan of their flavor profile. For the casual chocolate lover though, these bars are a value (the little ones are $2.69 versus Lake Champlain’s $3.75) and would make a fun gift.